Careful experimental design and planning before you stain your cells is important as it can improve your data and avoid unwanted repetition due to lack of statistical significance. There are a number of important things to consider such as sample preparation, experimental design and controls before you start the actual process of staining your cells with antibodies. Here we will discuss the importance of cell frequency in your flow cytometry experiment. Cell frequency can influence the choice of fluorophore and how many cells you will need to collect to obtain statistically significant data, crucial with rare populations. We have produced handy tables showing the relative frequency of cells in commonly used human, mouse and rat tissues, allowing you to plan and predict your flow populations. For more information on all the other important aspects you should consider before you start your experiment, to help optimize your flow cytometry, please read the related chapter in our updated flow guide and watch our dedicated webinar. Determination of the frequency of cells in your flow assay is important for several reasons. It will be relevant for you to determine how many cells you will need to stain in order to collect a statistically relevant number of positive or negative cells. Table 1 below shows how the frequency of a population will dramatically affect the number of cells collected if you start from the same number of stained cells in your sample. With cell frequencies of less than 1% you may want to stain and acquire more cells in order to collect enough cells. In addition although you may have a common cell type, such as T cells, in your starting population, if you perform gating strategies that look at smaller fractions of the T cell population, you will have to take into account the effect of the reduction in frequency. An example of this is shown in Figure 1. Although 100,000 cells were acquired, the gating strategy to identify the cells of interest leads to only 992 cells in the final gate. As you increase the complexity of your gates, collecting enough cells becomes even more vital to ensure the population you are interested in is a true population and not an artefact. Fig.1. Staining of human blood cells. 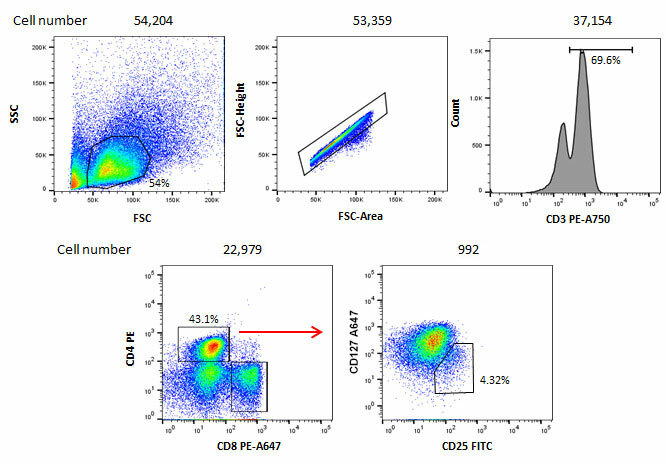 100,000 cells were stained with CD3 PE-A750 (MCA463P750), CD4 PE (MCA1267PE), CD8 PE-A647 (MCA1226P647), CD127 A647 (HCA145A647) and CD25 FITC (MCA2127F) to identify CD4 positive T regulatory cells. The gating strategy shows even though 100,000 cells were stained initially, after several gates have been applied, the final population only contains 992 cells. Cell frequency is also a factor when choosing your fluorophore. Choosing bright fluorophores is recommended for low density antigens but also for rare cells as background staining in the negative population may mask their fluorescence. Finally, when performing cell sorting experiments, the frequency of your cell population can have an impact on your sort. You will need to have enough starting material to sort a sufficient number of cells for your next experiment. In addition the cell frequency will have an impact on the time taken to collect enough cells; you may have to reduce your purity if the time taken to sort the cells becomes too long. Below are some tables, also available to download as a handy PDF for quick reference, to help you determine your cell frequency in common human, mouse and rat tissues. These values are for reference only and there may be variation due to sample preparation, individual variation and the strain of animal used. All values shown are percentages of total leukocytes in each sample. We have over 3000 antibodies validated for flow cytometry enabling you to identify the cells listed here and more. To find out more about our antibodies, antibody cocktails, kits and isotype controls go to our dedicated flow cytometry page. We also have dedicated flow cytometry resources giving in depth information into flow cytometry principles, controls, protocols and experiment optimization.